Many of you probably know Durb Morrison because of his spectacular Hell City Tattoo Fest, which is held twice every year in Columbus, OH and Phoenix, AZ. Hell City has long been one of America's most stand-out conventions. It's packed with all kinds of events and features, but its foundation has always been built on the high skill level of the artists who work at the show- Durb personally screens the portfolios of all artists applying to work there. 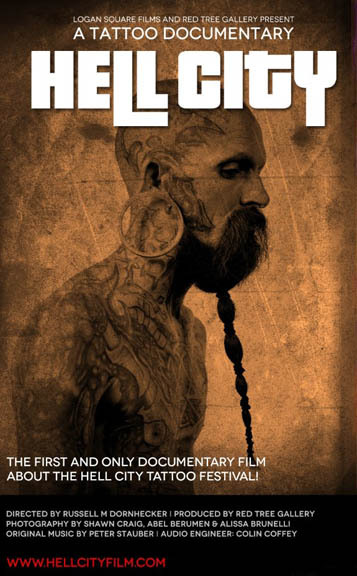 After 7 years of filming, Durb's friend Russell Dornhecker has released a documentary about the Hell City Tattoo Fest. It's a visual feast featuring the tattoo artists, collectors, performers, painters, showmen and downright characters that populate the Hell City Fest. Whether you've had a chance to attend the festival or not, you'll be entertained by this powerhouse film.